Earn your US GCDF & CCSP Credentials in Singapore today! How to earn the US GCDF & CCSP Credentials? First, you must complete the Facilitating Career Development (FCD) program. 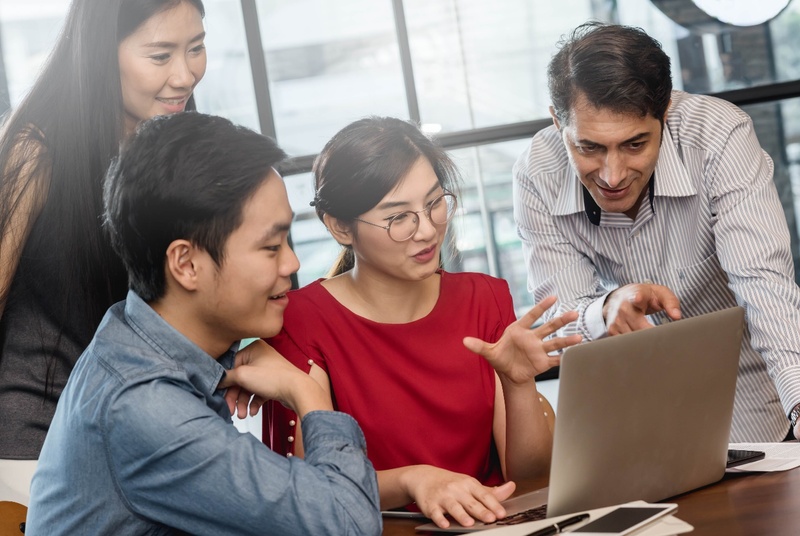 The FCD is a 120-hour program developed by the National Career Development Association (NCDA, US) to equip professionals with 12 career competencies to serve the workforce in career development. NCDA is the recognized leader and premier institution (since 1913) in developing standards for the career development profession, for the provision of career counseling programs and services, and for the evaluation of career information materials. Our hybrid FCD program is designed to suit the busy schedules of working professionals. It includes project work, practicum, self-study and face-to-face workshops. The best part is you only need to spend 5 days away from the office over 3 months, thus ensuring your productivity and visibility at work will not suffer. All FCD course applicants must have a recognised Degree with minimum 8 years professional work experience and a keen interest to make a difference. Places are available on a competitive basis. Be proficient in the basic career facilitating process while cultivating productive interpersonal relationships. Recognize special needs of various groups and adapt services to meet their needs. Follow the FCD code of ethics and know current legislative regulations. Learn how to be mentored to be a more effective FCD. Understand career development theories, models, and techniques as they apply to lifelong development, gender, age, and ethnic background. Comprehend and use both formal and informal career development assessments with emphasis on relating appropriate ones to the population served. Understand labour market and occupational information and trends. Be able to use current resources. Comprehend and use career development computer applications. Know job search strategies/techniques, especially in working with specific groups. Prepare and develop materials for training programs and presentations. Understand career development programs and their implementation, and work as a liaison in collaborative relationships. Market and promote career development programs with staff and supervisors. i. References. Two references are required. ii. Attestations. You will be asked to attest that your work is your own, that your answers are correct, and that you have read the NCDA Code of Ethics and will abide by it. iii. Complete 4 CCSP Case Scenarios Assessment online. You may not receive assistance from anyone else. iv. Blind Review. Your responses to the case studies will be sent to a professional trained as a reviewer. The reviewer will score your responses. *If you earn your GCDF before end 2018, you can apply for the CCSP without having to complete the 4 case scenarios online. Sign up today to secure your future & earn 2 International Credentials as a Career Professional! Provide coaching to employees/clients/students to align their aspirations with organisational goals, so as to ensure best-fit and high morale. Guide line managers to provide coaching to employees/clients to do the same. Deploy your talent to the best-fit roles through appropriate assessments, so as to achieve peak performance. Enlighten and inform employees/clients/students about taking ownership of their career and aspirations through relevant career theories. Stay updated and relevant with the latest information sources and technology platforms. Equip your employees/clients/students with employability skills so that they can move on confidently in any economic contingency. Develop yourself professionally as a Career Coach/Trainer in career development. Design and implement career development programs that are aligned with organisational goals, so that both employees/clients/students and the organisation benefits. Realise your talents’ potential through a systematic approach to stretch and prepare them for future roles. Recover your course investment many times over, due to your expanded mindset and new competencies. 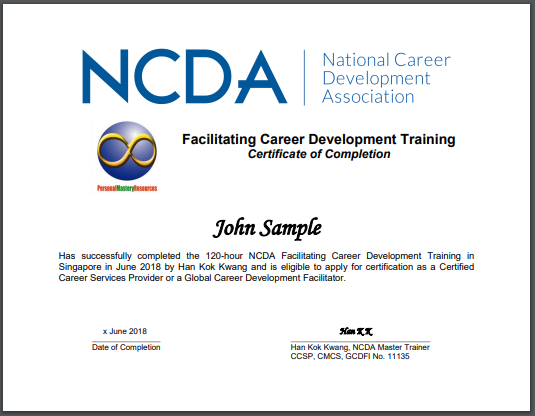 Han Kok Kwang, MBA (Distinction), is the First & Only NCDA (US) International Master Trainer in East Asia for GCDF and GCDF Instructor Certification. He is also a National award winning professional, Successful author of 5 career books and Founder & Director of Personal Mastery Resources, a niche training business. 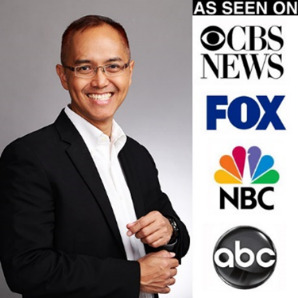 With more than 25 years’ successful experience as a senior corporate manager and career development entrepreneur, Han has empowered more than 50,000 individuals of 21 nationalities through his books, seminars and workshops. To know more about Han, visit www.Personalmaster.com. Why get certified by Personal Mastery Resources (PMR)? This program is offered by PMR & NCDA, the first, longest running and preeminent career development association in the world. NCDA was founded in 1913. As of June 2018, out of 63 US GCDFs, over 90% are trained by Han Kok Kwang, Founder of PMR. Han has been helping individuals earn their GCDF Credentials since 2010. If you put in the requisite effort, we will support and help you earn your GCDF &/or CCSP Credentials, every step of the way. Han, your Instructor, is the 1st & only Singaporean to be certified NCDA International Master Trainer in East Asia. As a successful workforce development professional with over 25 years’ experience, he was also a Singaporean pioneer in career development since the Ministry of Manpower started career service centres in the year 2000. *Don’t take our word for it. Preview the program through the experiences of our FCD participants below or simply check us out on Google. I attended the 120-hr CDF course conducted by Han in May 2016. Han is an amazing instructor who is willing to distil his years of experiences to his participants. Throughout the course, he shared personal experiences to help participants understand the topics. The course was extremely interactive, with plenty of discussions and group work. Han sets a very high standard for his participants to attain the certification. The case studies and project work was particularly stimulating and it gets participants to apply the contents and career theories taught in class. Participants were constantly reminded and challenged to step out of their comfort zone. Overall, it was a privilege to have attended Han’s CDF course and it has definitely helped me in my work and made me a better career coach. I would highly recommend not just aspiring career coaches, but also people who are already in this field to attend Han’s CDF course. I highly recommend Han's GCDF course for career development practitioners and HR professionals who are pursuing career development work. As a HR professional involved in career development activities, what drawn me to his course was the practicality aspect of it which I felt would be more relevant than another course in the market which was alot more lengthy and theoretical...And I'm happy to say I never once regretted my decision! While Han demands standards from his students, he has also been rather understanding and supportive, allowing an adult learner like me to manage my work and studies reasonably well...so thank you Han! Enjoyed the session thoroughly and Han is a critical reason for this. (I do not typically like to attend courses that are more than one day but Han has made it very enriching and interesting). Time really well spent. Highly recommended! You are an amazing inspiration, Han. So thank you for everything. I am grateful to be able to interact and get to know so many touch points for career facilitation. I benefitted from the CDF Program because it helped me gain a holistic view of career planning and development for different people, not just for students but working adults. The training provided a comprehensive appreciation of the CDF system, tools, processes and resources which enabled me to be more proficient in leading my university career services and future developments. The competency-based curriculum of the CDF course provided me with many practical ideas and tools in my professional practice in the field of Career Guidance and Development. Han is a resourceful, informed and inspiring trainer and generous in sharing his insights into the world of work. For a lack of a unified approach to the training of career development practitioners, the CDF course can bridge the gap in levelling up the professionalism in this field. Backed by strong fundamentals and thought leadership from the National Career Development Association (NCDA), the CDF certification is indeed a professional development opportunity not to be missed. I am a lecturer and a teacher mentor to a group of polytechnic students. I signed up for this workshop to acquire guidance on how to be an effective career facilitator to my students. Although I have many years of experience advising students, I still find it challenging as I have no practical tools and effective skill to assist my students. With the practical cases, new tools introduced in class and the 40 hours project, I have gained new knowledge and skills and am more confident now in facilitating career choices. The guidance given by Dr Han and the sharing of experiences from my fellow course mates has opened up my box to see many possibilities in this field. I believe I can make a difference to my students and give more guidance or direction in their career choices. I learnt so much from the trainer, Han and from other co-learners/participants. Overall, I am very pleased with the learning and have the methodology and tools to use in my career facilitation approach. For a new career coach, I found the CDF Program professionally put together with a step-by-step process, which practically guarantees the learning outcomes. Each lesson builds and expand on core concepts to completion. Han, the trainer’s methodologies is concise and efficient in delivering the necessary information. This is definitely an excellent experience. I would recommend this course to all aspiring CDFs. The CDF program delivered by Han has opened up my mind on career coaching and development. It helps me to build a strong foundation and equipped me with relevant skills and knowledge to assist others in their career planning and development. One of the best investments I have made so far! Han is very generous in sharing his experiences and resources. Always very patient and nurturing in supporting us in our CDF journey. Thanks Han! For the knowledge imparted selflessly and thanks for the encouragement. The course serves as a very good foundation for people who want to move into career related work. It shares a comprehensive set of competencies. Han shared some good insights on the career development landscape in Singapore. The programme is very structured and well organised. It also provided good theoretical knowledge for practitioners like me who have been in career services for some years. Han is able to deliver the course materials in a very practical way and with relevance to our work. The comprehensive CDF curriculum ensured a firm foundation and practical experiential learning for us. Han is well versed in the field and his ability to connect with the participants made all of us enjoyed the lessons tremendously. I entered this workshop with an exploratory mindset because I was still uncertain if I were to embark on the career coaching path. Through the practical activities and guidance given during the workshop, I gradually gained confidence. Especially with the practice cases and 40-hour project, where I benefited greatly by applying my new-gained knowledge and skills and derive satisfaction when I realise that I can make a difference to my students! Han is very knowledgeable and also very patient and encouraging. The instruction and his style of instruction is the aspect of the course that facilitated learning. Thank you for the rich learning esp. sharing from your industry experience, and providing such a reasonable pace of learning for learners. The relaxed and comfortable pace of learning is helpful to provide a conducive learner-centred environment. Better understanding of real job market, to provide assessment tools for students and theories relevant to the understanding of this course. Trainer was practical, realistic, clear and precise, fun and engaging. Varied teaching techniques, not just lectures but include games, activities & discussions. Interesting and engaging. Good practical resources given. Han is an excellent and motivating coach. Enjoyed his facilitation. Han makes a conscious effort to help us learn how to fish, rather than fish for us. I guess that is the art of coaching. He demonstrated as role model for us. Thanks!